In recent years the STEM educational initiative – Science, Technology, Engineering, and Math – has gradually evolved into STEAM, as both educators and employers have gained a greater appreciation for the importance of arts education (the A in STEAM) in an innovation-driven economy. While it has long been held that early exposure to the arts, in particular music, contributes to the development of a well-rounded character, recent research and practical application both quantifies these benefits and identifies them as essential for developing marketable skills. Additionally, students themselves report a greater sense of discipline, purpose, organization, belonging, and self-worth, all of which translates into a young person better equipped to tackle higher education and the marketplace. SDYS also supports statistical research through a partnership with the Center for Human Development at UC San Diego and participation in the Center’s SIMPHONY study. The goal of SIMPHONY is to explore how musical training influences a child’s brain and the development of skills like language and concentration. The results may then be used to bolster the case for music education and to refine teaching methods, not just in San Diego but nationwide. 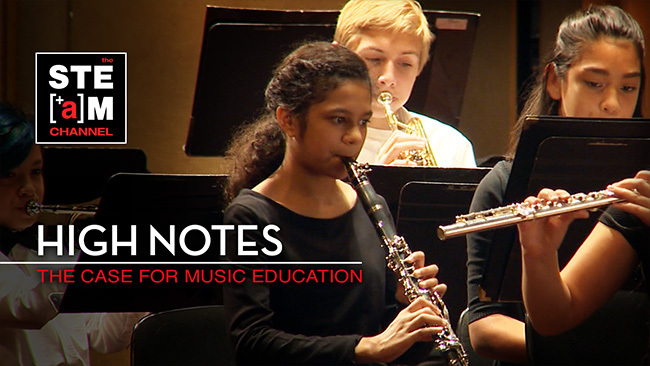 “High Notes: The Case for Music Education” provides an overview of a few of SDYS’ activities, including their Community Opus project, the SIMPHONY study, and their in-school activities using the Chula Vista Elementary School District as a representative sample. (Press Release) This September UCSD-TV premieres “The Rhythm of Her Step: A Song of San Diego,” an energetic, site-specific dance video that utilizes the talents of local choreographers Jean Isaacs, grace shinhae jun (bkSOUL), and UCSD-TV director John Menier, to educate urban teens and young adults about the vital topic of HIV/AIDS awareness. The program premieres September 15th at 8:30pm on UCSD-TV and repeats throughout the month. The half-hour video follows the story of a teenage girl as she faces her recent HIV positive diagnosis. Told through flashback sequences that incorporate dance, poetry and rhythmic music, the girl evaluates the choices she made that lead to her HIV status and ultimately takes responsibility for her actions and their consequences. The program was sponsored by County Television Network (CTN), Jean Isaacs San Diego Dance Theater, and UCSD-TV. A DVD version of “The Rhythm of Her Step: A Song of San Diego” will also be distributed to schools throughout San Diego County as part of the program’s grant-funded effort to educate at-risk youth, particularly African-American and Latina women, about HIV/AIDS prevention. Shot at various locations around Encinitas, including Lou’s Records, the San Dieguito Boys and Girls Club, and San Dieguito Academy, the program features local dancers from Jean Isaacs’ San Diego Dance Theater and bkSOUL, a local Hip Hop/postmodern performance company. The music featured in the video was composed and performed by local DJ Shammy Dee (Arash Haile).